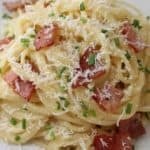 Using Elmlea or another cream substitute helps lower the calories and fat in this classic Italian pasta dish. Meanwhile fry the bacon in olive oil until it starts to crisp. Add the garlic and cook for a further 2-3 minutes. Mix the egg yolks, cream/cream alternative and parmesan in a bowl. Season with a pinch of pepper. Drain the pasta and add the cream mixture, stirring well. Add the bacon. Garnish with the chives and a little extra parmesan.